More linear coverage with fewer bags. While they can hold up to about 60 lbs, at that weight they're pretty hard to manage - plus they won't easily stay put. (Being tube bags, they'll roll.) For these reasons, we sell them with 50 lbs of fill unless requested otherwise. These bags are sturdy polypropylene, treated with a minimum of 1,600 hour UV resistance, and have filled dimensions of approx. 24"L x 8"W x 4"H. Lifespan in sustained sunlight averages about 3-6 months before they start to photodegrade. If you just want empty tube sandbags, you can find them here. Prices are FOB; we'll load you up. 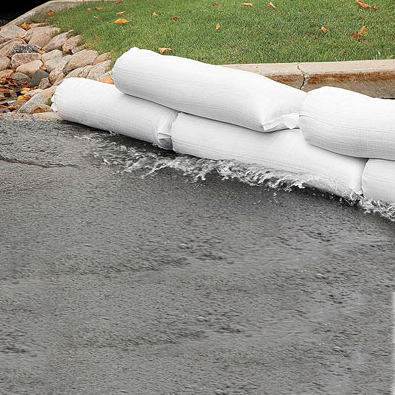 Please be aware that a standard pallet of sandbags = 50 bags (averaging 50 lbs. each) and has a gross weight of about 2,550 lbs. A truckload is 20 pallets with a gross weight of about 48,000 lbs. Within 30 miles of downtown Albuquerque: $1.00 per bag will be added for delivery, up to 50 bags. Over 50 bags and/or beyond 30 miles: call us & we'll give you a quote. Delivery charges will be calculated based on size of purchase, urgency and your location. Call us at 505.750.3478 or email us at info@nmdirtbags.com. Reasonable lead time may be necessary to complete & deliver your order, based on our inventory & weather conditions. We pride ourselves on keeping our commitments. Rush orders (24/7) may be possible; surcharges apply.